United Nations (United States) (AFP) – Palestinian leader Mahmud Abbas tore into the Trump administration Thursday, refusing to accept the United States as the sole mediator in the Middle East conflict, a day after Donald Trump promised a “very fair” peace plan. Speaking a day after the US president said he favored a two-state solution to end the Israeli-Palestinian conflict and vowed to unveil a new peace plan within months, Israel’s Prime Minister Benjamin Netanyahu hailed Trump for his “unwavering support”. AFP / ABBAS MOMANI. 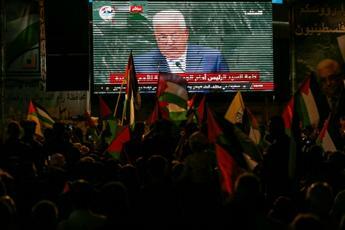 Hundreds of Palestinians gathered in the West Bank city of Ramallah to watch Palestinian president Mahmud Abbas address the UN General Assembly. Palestinian leaders have long seen Trump’s administration as blatantly biased in favor of Israel and seeking to blackmail them into accepting their terms. “From this august platform, I renew my call to President Trump to rescind his decisions and decrees … in order to salvage the prospects for peace,” Abbas said. 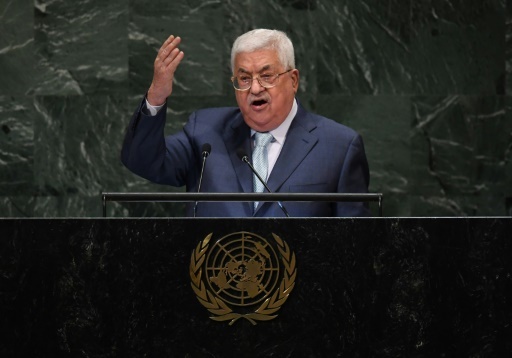 Last February, Abbas called for an international conference to relaunch the peace process under a new mediator to replace the United States, in an address to the UN Security Council. On Thursday, he said there could be no peace without an independent Palestinian state with east Jerusalem as its capital, calling on countries to recognize the state of Palestine. Trump pledged Wednesday to unveil a new peace plan by the end of the year, turning heads by supporting for the first time a two-state solution. His endorsement of the goal of a Palestinian state, long the focus of US peace efforts before he came into office, was decidedly lukewarm — and he slightly backtracked from it later. While Trump’s comments sparked concern among some Israeli right-wingers who hoped he would bury the idea of Palestinian statehood once and for all, Netanyahu had warm words for the president. “I look forward to working with President Trump and his peace deal,” said Netanyahu in his speech in which he also praised Trump and the American ambassador to the UN, Nikki Haley, for their “unwavering support” at the world body. Israel has long argued that the UN’s Palestinian refugee agency, known as UNRWA, has perpetuated the Middle East conflict by maintaining the idea that millions of Palestinians are refugees with a right to return to homes in what is now Israel. The announcement last month that the US — which had been UNRWA’s biggest contributor — would no longer fund the agency raised a question mark about the future of a range or social and welfare programs as well as fears that many schools would have to close. UNRWA received pledges of $118 million Thursday from donor countries to help plug some of the gap. Kuwait and the European Union were among the biggest contributors, UNRWA chief Pierre Kraehenbuehl told reporters. Featured Photo: AFP / TIMOTHY A. CLARY. Speaking a day after Donald Trump said he would unveil a new Mideast peace plan within months, Palestinian president Mahmud Abbas said the US president could not be regarded as a neutral broker.